A Desirable Temperament For Your Mastiff…It’s Up to You! With the risk of speaking the obvious, the mastiff is a breed of large dogs; so they can be really intimidating when it comes to physical appearance. 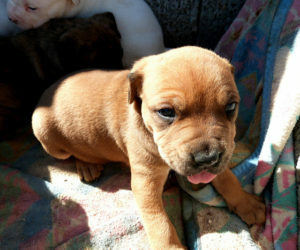 But in spite of the large physic, the mastiff is naturally – and generally speaking – cool and easy going in temperament. That said, temperament and character of almost any dog really is individual and highly influenced by the way a dog is brought up. 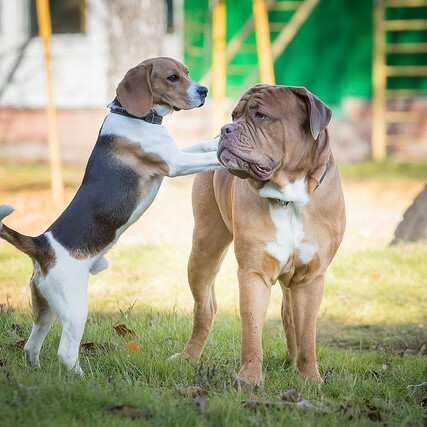 Mastiffs are no exception and in their young prime will need adequate training to bring out the good qualities and depreciate the unwanted behavior. Mastiffs can be very shy, especially if they don’t get the proper amount of social exposure to people and other dogs. In fact it can be right on the brink of paranoid fear if you shelter your dog. Some may find that shyness in a dog endearing or “cute”, but it can be a real hazard if someone trying to be friendly to your pet may somehow corner him and get a real good chomp to the hand. Mastiffs rather do their own thing; you may teach it a trick one day and he’ll ignore the command the next day. Mastiffs are smart, they remember and they know a command when they hear it. Stubbornness and difficulty in training will be more evident in later years and if they think “I’m the boss”. 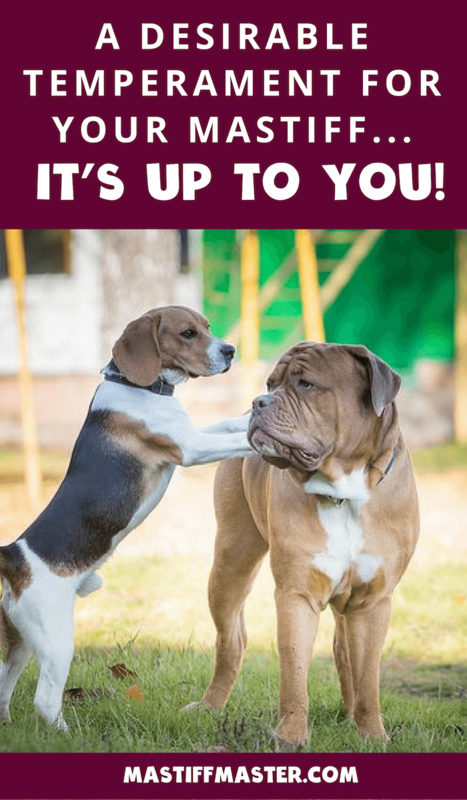 Mastiffs are loyal, and they really love their masters, but you have got to be a “Master” to overcome the stubbornness by asserting yourself as what some call the “pack leader” or “alpha”. Again establishing this in younger years makes for a more obedient dog when older. 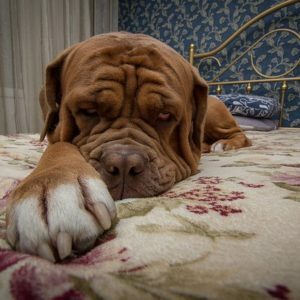 Mastiffs have the sensitivity of two-year-old children for most of their life. Any big noises like thunder or yelling can make them cower. This can be considered a degree of shyness but negative emotional stress like anger if only expressed in vocal tonality can easily crush their spirit. Sensitivity to a degree can be overcome with stimulus but you do not want to expose your mastiff to anger, hate, and belligerence; this distances you emotionally from the dog. With mastiffs, like with children, you ought to be in control of your tonality and know that sometimes a calm, disapproving voice can be just the right amount of discipline in those times of correction. So it is up to you to nurture and train the type of temperament you want in your mastiff. Irresponsible owners will let the dog do what it will, resulting in a very unstable, anti-social, and disobedient dog. Dedicated mastiff owners will ensure the mastiff’s upbringing is nurtured with discipline to build a character with desirable qualities. Imagine a mastiff that growls and cowers from strangers passing by, pulls YOU around on the leash and ignores your every command. 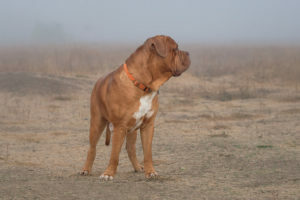 Now, imagine a mastiff that comes when called, sits when commanded, passes strangers and other dogs on the street without so much as a twitch (or maybe just a casual wag of the tail), and greets your friends at the door without barking fiercely or making a nuisance of himself. It’s really only up to you.